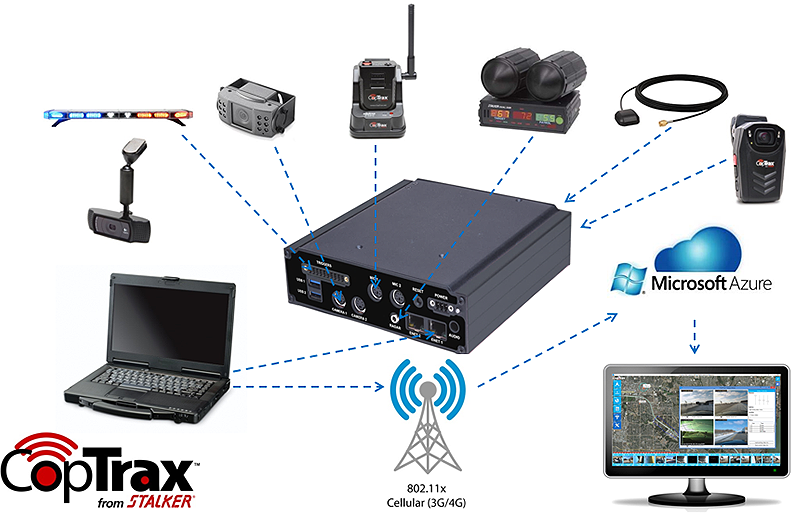 Watch a traffic stop, warrant service, or any other event in real time using CopTrax Live Look-In through the CopTrax Command & Control Center. At the same time, see the big picture with real-time GPS map positioning of all CopTrax-enabled assets using the Automatic Vehicle Location feature. 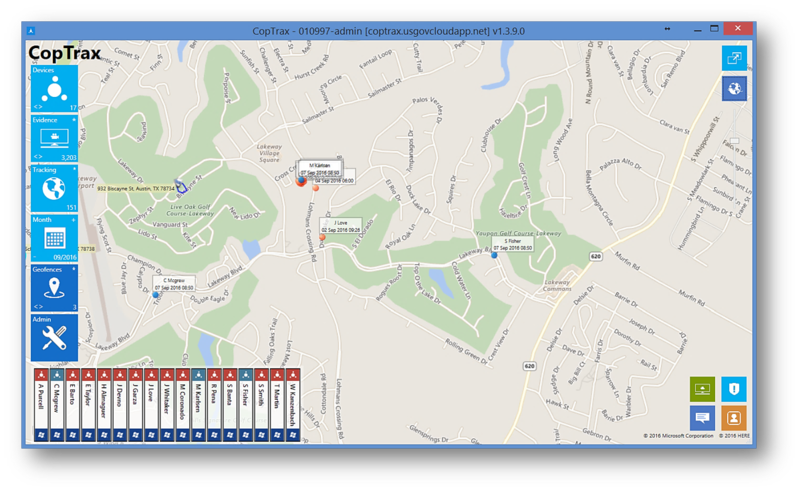 Taken together, Live Look-In and Automatic Vehicle Location provide command staff the big picture view needed to make informed decisions based on real-time video and audio as an event unfolds. Automated “background record” feature can store up to 120 hours of video on a secondary hard drive. Background videos are redundant recordings, and require no officer intervention. Secured SD card requires a special tool to remove. Watch streaming video in real time from any Internet-connected computer. Video uploads to Cloud or Server without human interaction. Video evidence is automatically uploaded through either 3G/4G cellular connection or wireless Wi-Fi, based on the fastest transfer available. When a recording is stopped, the upload process begins immediately without officer interaction. Video segments are automatically indexed according to date, time, and event identification, and by officer identification, GPS data, vehicle identification, case number, and type of incident. The system footprint is a small front-facing camera, a rear window and a rear-seat infrared cameras, and a small interface module. Separate wireless microphones capture speech and audio during the incident and synchronizes it with the video signal. 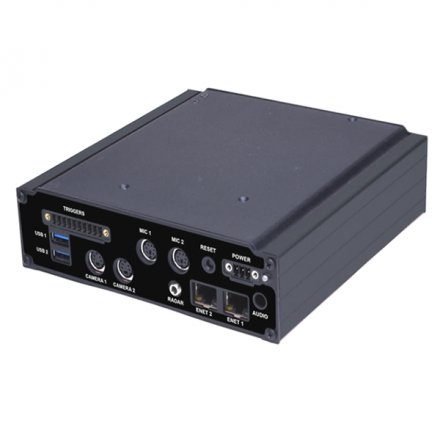 Being a software solution, CopTrax is priced less than other video systems. New updates don’t require new hardware and new laptops don’t require new software. Plus, secure Cloud storage eliminates the backoffice expense of file storage, archiving, and labor. In the long run, CopTrax costs less to own. Video Files are Safe and Secure with Commonality of Architecture. Wireless, automatic upload maintains chain of custody by assuring the video evidence is untouched by human hands. Files can be uploaded to the Criminal Justice Information Services (CJIS) compliant Microsoft Government Azure Cloud storage for 24/7 security, backup redundancy, and high-speed access. 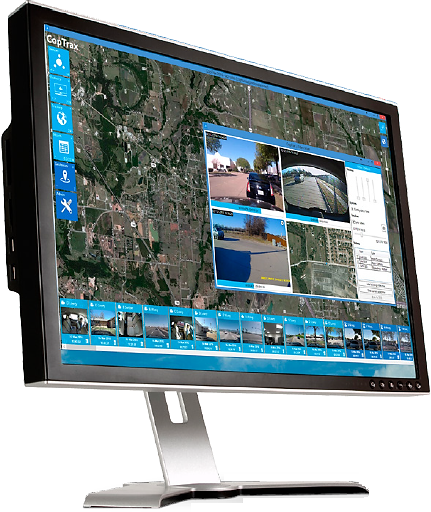 Powerful video file management through the CopTrax Command & Control Center Dashboard enhances security, yet allows easy access and searchable archiving.